With just 1°C rise in the average temperature of the Earth till date, impacts of ‘Global Warming’ and climate changes like extreme weather events, frequent flooding, extended droughts, more violent hurricanes, polar ice melting etc. are already visible. Most Nations have agreed that Earth must not be allowed to get warmer than 2°C to prevent catastrophic impacts of Climate Change. Yet action on the ground is alarmingly poor because of inadequate awareness about this invisible but imminent danger. 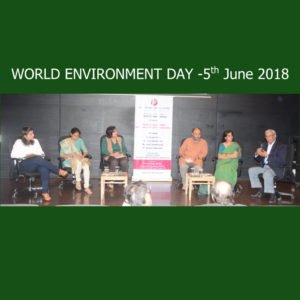 Pune International Centre (PIC) in May 2018 organized a workshop on ‘Climate Literacy’ (Awareness) in collaboration with Centre for Environment Education (CEE) and several other environmental NGOs and expert groups. The “Climate Collective Pune” group (CCP) evolved from there for collective actions to enhance the public awareness about the climate change at every level – individuals, communities, institutions and businesses and to create a citizen movement for ‘Climate Action’ for making the Pune region ‘Carbon Neutral’ by 2030. 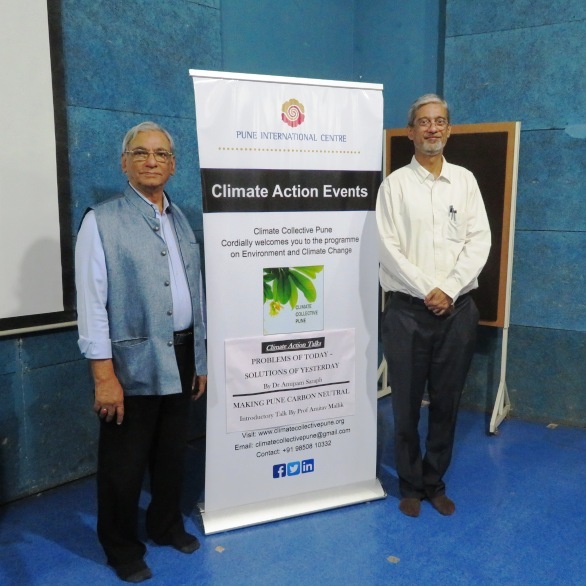 The CCP endeavours to serve as a platform for Pune citizen groups and government officials and political leaders to remain informed about ‘climate change dynamics' and work towards rapidly reducing the ‘Carbon Footprint’ of the city at every level. 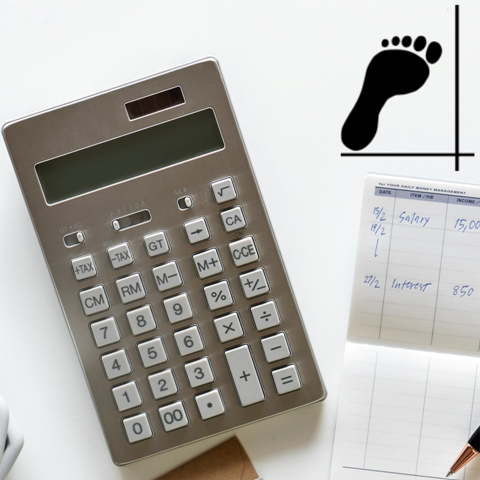 The main focus will be on improving energy efficiency across all applications using electricity and a conscious shift to maximise the use of Renewable Energy (RE) sources and minimising the dependence on fossil fuel sources. CCP group will also work for enhancing the ‘Carbon Sink’ capacity of the city region by increasing forest and green cover as well as by encouraging adoption of technologies for Carbon Sequestration and Storage (CSS). 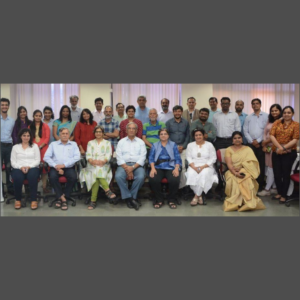 This website is created and managed by the 'Environment and Climate Change Project' of Pune International Centre (PIC) to serve the above objectives of the ‘Climate Collective Pune’ group. 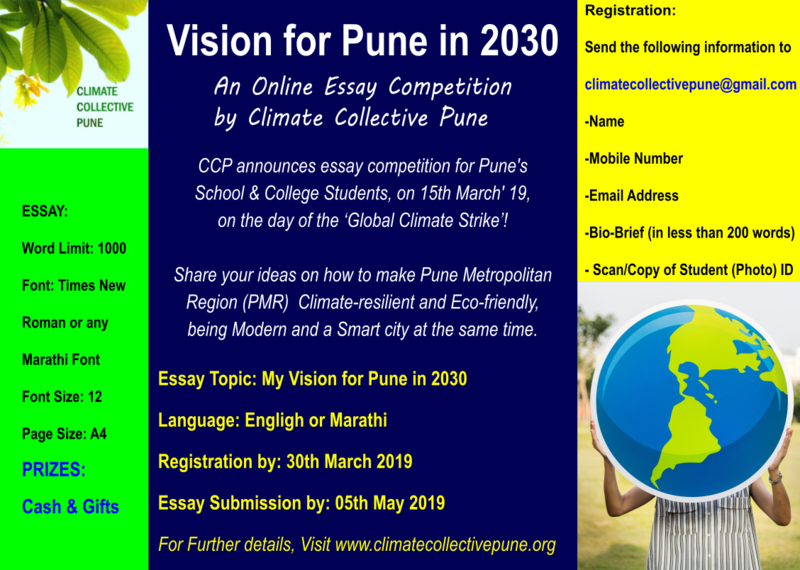 CCP announces Online Student's Essay Competition in Pune on the occasion of Global Climate Strike! Do you care for our World and its Future?... 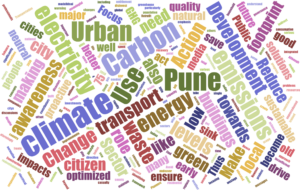 Then share your Ideas and Vision with us! Register your name before 30th March 2019 and Send your essays on 'My Vision for Pune in 2030' in English or Marathi by 05th May 2019 to climatecollectivepune@gmail.com. Calculate your Personal Carbon Footprint. 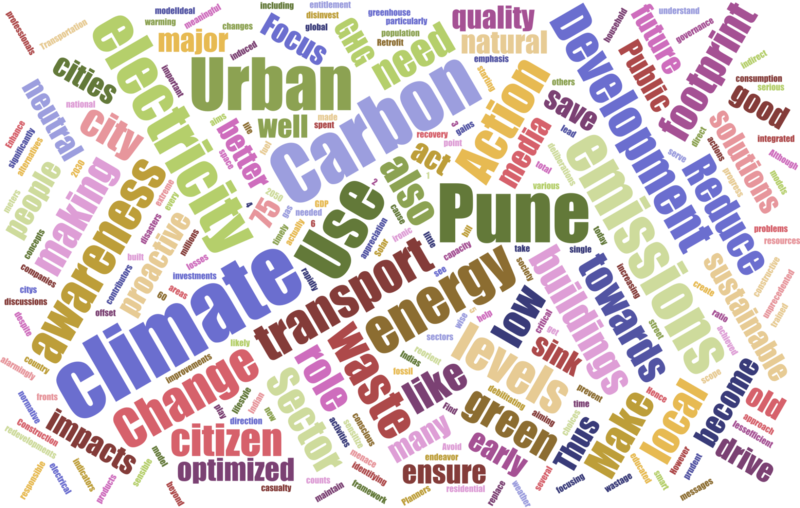 Know more at the Carbon Neutrality Page. Do you care about Climate Change and wish to work for it? We are looking for interested professionals or students to join us, at the Climate Collective Team at Pune International Centre (PIC). Only real qualification is keen interest in Environment and Climate Change issues and bandwidth for some proactive work. Our focus is on enhancing climate awareness, researching and designing climate-friendly initiatives and engaging with the community. PIC, as a Think Tank, is working towards these goals with a view to making Pune Carbon Neutral by 2030.